Wow! Here I am calmly planning out the spinning and knitting I'll do this weekend when I hear keys in the front door. OK.....no big deal.....DH is home from work. Imagine my surprise when I look up and there stands my DD!!!! She decided to surprise me by flying home for my birthday. DH picked her up at the airport - she'd been planning this surprise for a while....and boy was I surprised! Needless to say, I WON'T be doing any spinning tonight.....good thing I got an hour of spinning in last night, eh? Spending time with my DD is the best present ever! I then spun for an hour last evening (I've got to keep up with the Summer Spinning Challenge!) 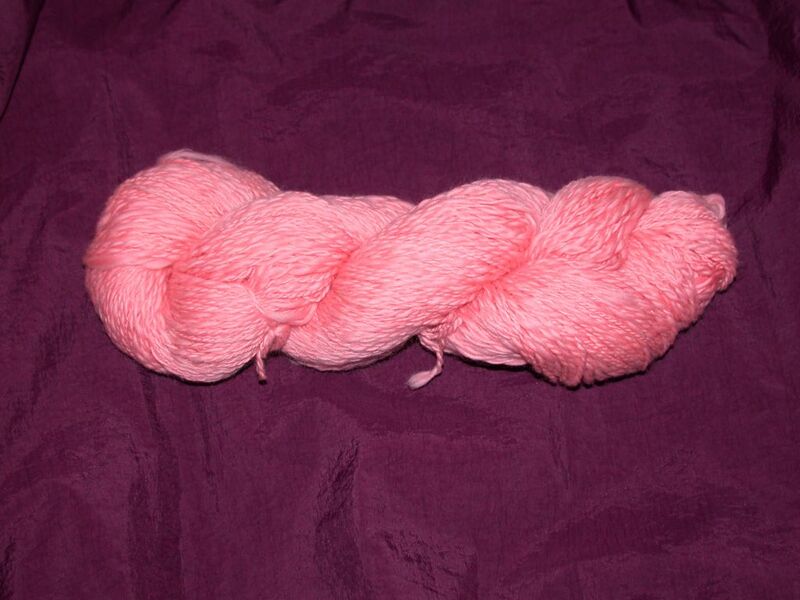 I spun my coral colored Merino top again....I think I'm now down to about 1/2 a lb. left to spin! Wahoo! If I can just keep this up, I might actually make a dent in my fiber stash by the end of the summer! 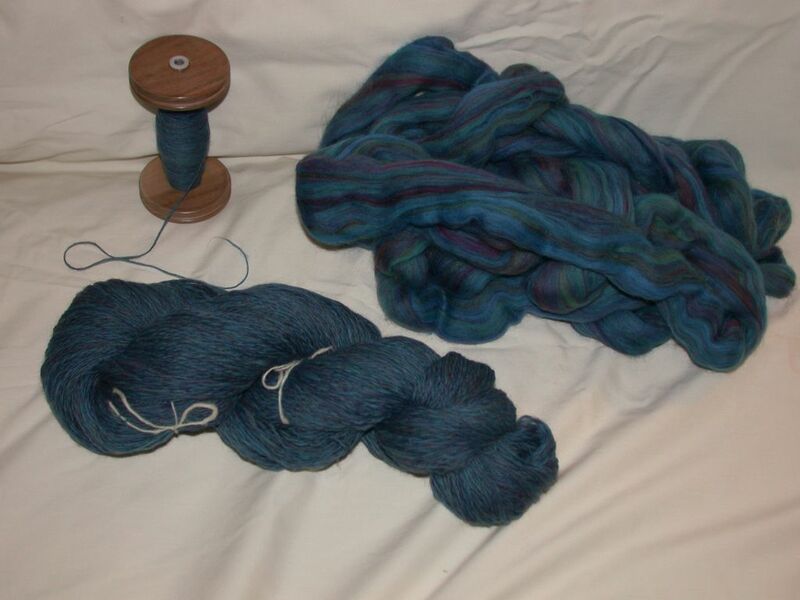 The skein in the picture is what I plied on Sunday....I finally got around to taking a picture! Now, for destashing my yarn. I've joined the "Bertiealong". Bertie has created a gorgeous beaded scarf pattern - Check it out via the adorable duck button on the right. I had some Cascade Success (50% Alpaca/ 50% Silk) that would be just perfect for the project. Yes...the yarn really DID come from my stash. I KNEW I'd find the perfect project for it.....eventually! 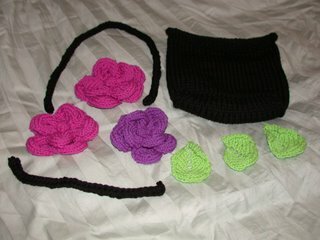 Since it's raining so much outside, I haven't been able to do much other than knit and spin (Wahoo!!!!). What a wonderful dilemma! Last night, I spun for 1 1/2 hrs. I finished spinning a bobbin of the coral colored Merino. I then finished my evening of spinning by plying it all together to produce a skein that weighed about 3 3/4 oz. This yarn is not nearly as thin as the blue Merino. However, since my "spinning time" for this particular yarn has spanned a 4 year period (from the summer of 2002 until now), each skein seems to be different - a few are semi-bulky, some are worsted, and some are a DK weight. This is part of the reason I joined the Summer Spinning Challenge. I need to get the each group of roving/fiber spun up around the same time period so I have at least a chance of producing a consistent yarn! 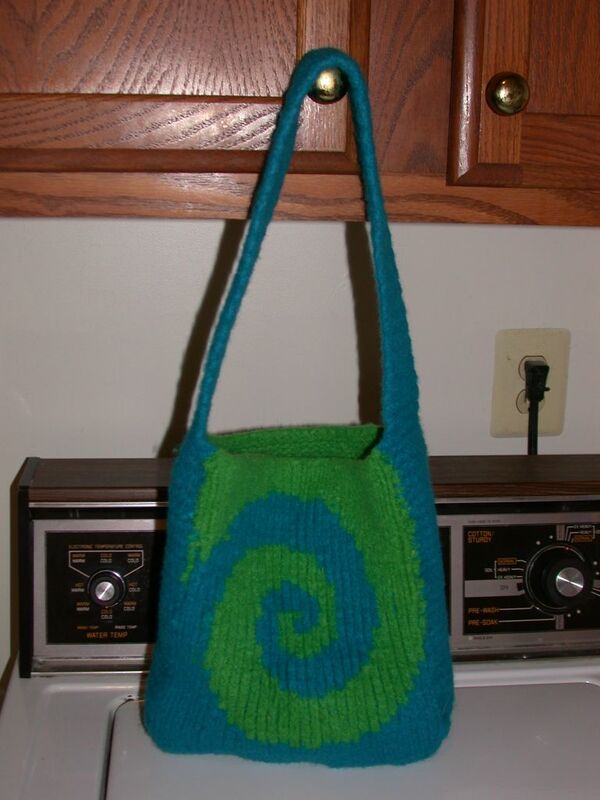 Today, I felted the Brainwash Bag and stuffed it with towels to hold its shape while it dries. I can't wait until it's done drying so I can post a picture. I'm quite pleased with how it came out. As damp and humid as it's been around here, I think the drying process will take a LONG time. 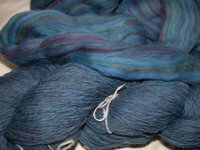 As promised, here are the "progress" pictures of the blue multi Merino I bought at "The Fold". It's very nice to spin and is producing a wonderful soft yarn. In the first picture, the one on the left, I'm showing a close-up to show the difference between the roving and what I've spun. The roving itself is pretty, but I really like the depth the multi-colors give the yarn once it's spun. 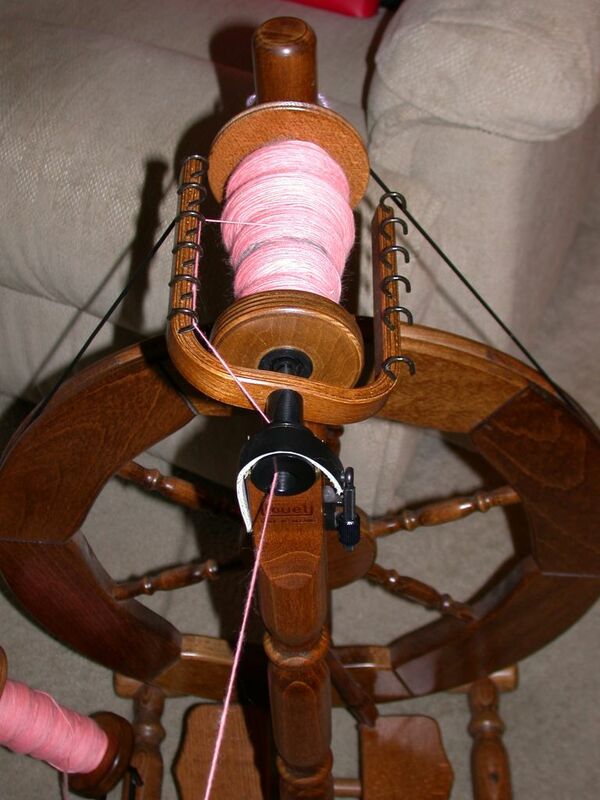 The second picture shows the bobbin with a bit of the spun yarn unwound.....to show how fine the singles are. You can "click" on the photo for a closer view - you'll be able to see the colors of the roving much better that way. Well, so far so good. I'm keeping to my goals for the Summer Spinning Challenge! (And possibly working ahead just a bit! This is a good thing and will make up for any "slow" spinning weeks). Last night, I worked in a half hour of spinning - again, with the coral colored Merino. I was too tired to do any more than that. The heat and humidity just sap your energy. You know it's bad when you're too tired to spin! Tonight, I spent two and a half hours working on the blue multi-colored Merino for my mom's scarf. I even plied the two full bobbins for a total of just under 5 ounces of plied yarn! I took the two small bobbins from the Lendrum and plied them using my Louet (I was too lazy to setup the plying head on the Lendrum since I want to spin on the "regular" bobbins Monday night.). Just as I suspected....the resulting yarn is rather thin. Mom's scarf will definitely take a while to knit....small needles and thin yarn. It's really pretty....and the spun/plied yarn looks even prettier than the roving. I'll try to post a picture of both to show the contrast. I'm not sure how well it will show up on here, but I'll try. Yesterday was a wonderful day! I successfully learned the "Magic Loop" method for knitting a pair of socks on a single needle. It's really cool and quite a unique approach. It makes you wonder how people thought these things up....perhaps a favorite canine had run off with some of the wooden DPN needles? When my dog, Sandy, was a puppy, she thought my Crystal Palace Bamboo DPNs (that I was using for my FIRST pair of socks) were special "doggie sticks". She stole two of them proceeded to chew them up! Luckily, I had been working on the heel flap, so I only had 3 needles with "live" stitches and she "stole" the two empty needles. (Smart dog!) This did, however, slow down the completion of my first sock. I had to wait until the next morning to trek out to the yarn shop in search of more. Needless to say, I now typically buy TWO sets at a time....just in case! I even mananged to work in 1 1/4 hrs. of spinning last night as well. Wahoo! I'm definitely trying to stick to my goal of spinning for 5 hrs. per week for the Summer Spinning Challenge! I decided to spin my Coral colored Merino top since it was handy (in the family room where the TV is....setup and ready to go!). I do need to ply my two bobbins of the blue Merino multi that I'm spinning for my mom's scarf before Monday, when I go to my usual spinning group (Spinning on Mondays does NOT count toward my goal of 5 hrs. per week). ARGH!!!! As stated by Robert Burns, "The best laid plans of mice and men gang aft aglay". Today is the first day of the "Summer Spinning Challenge".....and I ran "full boar" into it - I managed to talk about spinning for about 5 minutes. Did I manage to spin? No. Of course not. I'd planned to, but life and a knitting project intervened. 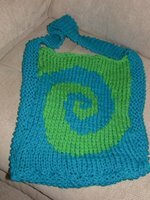 I'm trying to finish up the felted Brainwash Purse I've been knitting. I have the front and back completed....all ends woven in. The handle (that's also part of the sides and bottom) is complete as well. I've got MOST of it sewn together......so I'm almost ready to start the felting process. Wahoo! UPDATE!!!! Finished sewing the bag together. The pattern shows the handles being longer, but I did the length as per the directions and put it together as per the schematic.....so keep your fingers crossed! Spinning Workshop - A Wonderful Success! Wahoo! We had a FABULOUS time today at the Celtic Festival in spite of the fact that it was a very sunny, very humid, 90+ degree day (not sure of the exact temperature, but it was somewhere in the 90's....the type of day where you sweat even if your sit very still in the shade!). Amy, the president of the group hosting the festival, took us on the grand tour of the festival via the shuttle driven by Beth. The festival had tons of food, entertainment, and workshops as well as some wonderful shops for purchasing a wide variety of Celtic items. The spinning workshop went really well. All 4 of us had a wonderful time....and all the students enjoyed it as well. We had 14 hand-made drop spindles and ALL of them were in use....as well as a few of our personal spindles. Everyone (teachers and participants) seemed to have a great time. A few folks went to the other tent to continue spinning once the workshop was over. I do believe that some of the participants are now addicted to spinning......of course we encouraged this addiction as much as possible! Our stellar student was a young girl named Amber. She was PHENOMENAL!!!! Not only did she catch on quickly, but she was very focused and totally filled the spindle! I wound the yarn off for her, so she could fill it up again. When we ran into her a short time later, she'd ALREADY nearly filled the spindle a SECOND time! She was very excited about the prospect of making yarn for her dad to knit into the socks and shawls that he crafts for the Renaissance Festival. She's one sharp cookie as well. She was already trying to determine what to charge for her hand spun yarn and how much her father would need to purchase to make the socks and shawls. I believe I saw an entrepreneur in the making! I'm truly hoping we're invited back to do the workshop again next year. I LOVE sharing the "love of fiber" with others. My only hope is that it's just a bit cooler next year. Wow.....I'm going to get real busy real quick. Knitting......I've got sooooo many projects "screaming" for attention. 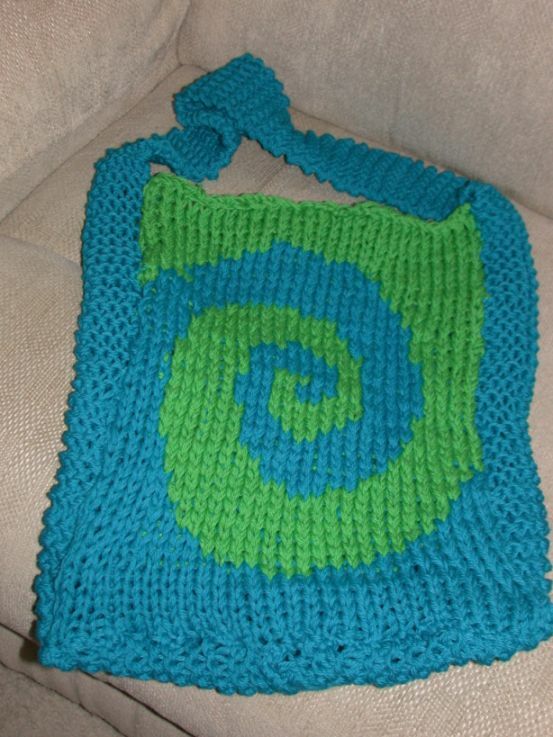 First, though, I need to finish the felted bag I'm making for a friend. My friend, Paula, is a fabulous artist. She got an idea a few weeks ago that perhaps we could "share" our talents with each other. She loves the felted bags that I've shown her (and knows I've made several myself) and I love the hand painted stools she makes. Soooo......we agreed that she'd make me a stool and I'd make her the felted bag. She's already done with her project, and I'm only partway done! I keep changing how I'm doing it - Faire Isle vs. Intarsia method. I can't decide which gives the better effect. I've ripped it out 3 times so far! ARGH!!!!! I'm so far behind! In my effort to keep up with my spinning, I signed up for the Summer Spinning Challenge. Spinning every other Monday evening is not keeping up with my stash acquisition. I've set a goal of spinning about 5 hours per week (in addition to my Monday evening spinning). I have to finish the merino for my mom's scarf AND make at least a dent in my stash! Setting goals and sharing them with the others that signed up should help keep me focused and on track! I've also signed up for the Maple Leaf Sock Knitalong. This is to help whittle down my supply of sock yarn. 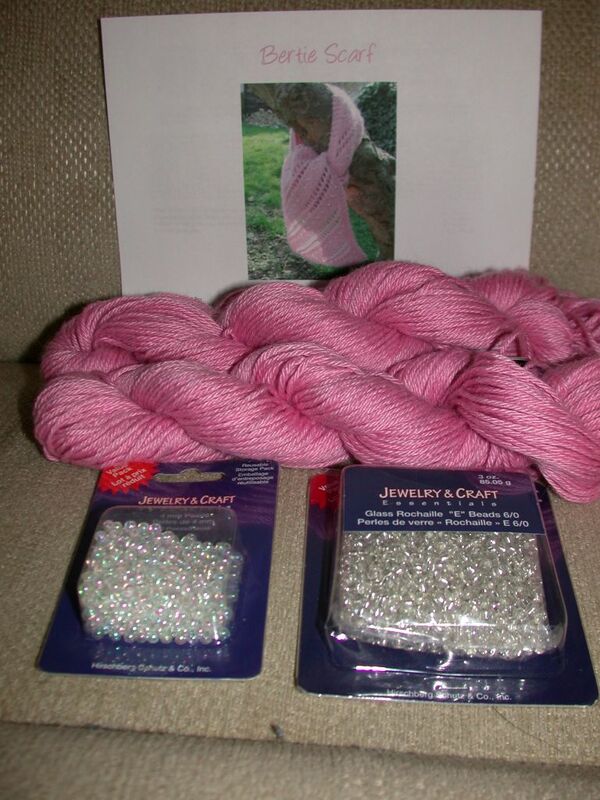 I'll be trying to use up some of the "plain Jane" sock yarn. Then, I can concentrate on the lovely sock yarn my Secret Pal sent me earlier....as well as the yarn I picked up at "The Fold" and Maryland Sheep and Wool. I'd never done a sock knit along....but I'm sure it will be a lot of fun! Also, if I get stuck on the pattern, there are PLENTY of others to help me sort it out. I've got a little bit of time, though, as this doesn't start until July 1st. To kick off all this craftiness, I'm going to the Potomac Celtic Festival tomorrow and will be one of 4 instructors teaching a workshop on hand-spinning using drop spindles. It should be a lot of fun....plus, I'll get to listen to all the Celtic music and entertainment while I'm there! My SP has spoiled me once again.....this time, it's an early birthday present - a felting extravaganza! Whew....where do I start? 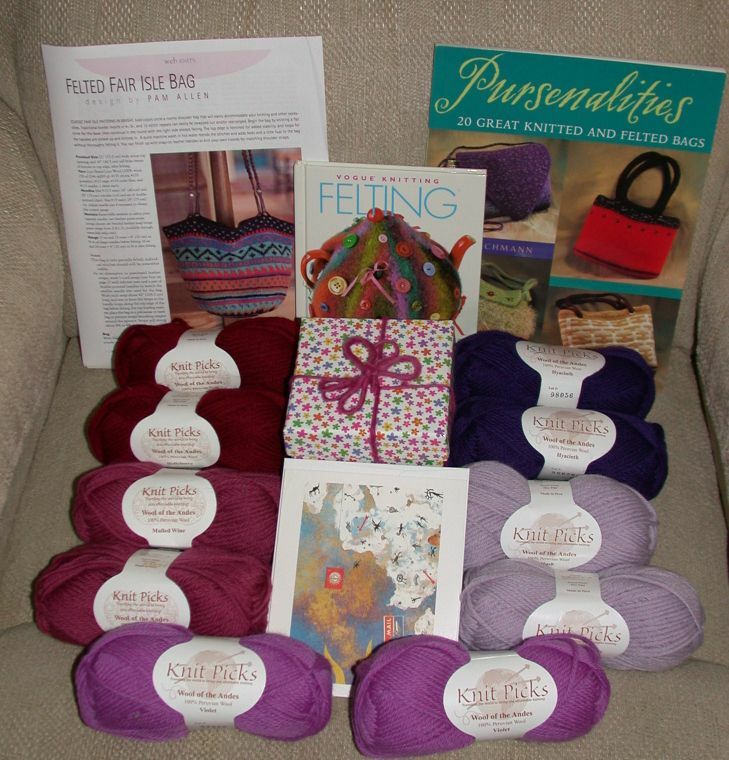 The package contained two books: Pursenalities and Vogue Felting on the Go. There was a lovely pattern for a Faire Isle bag tucked inside as well. 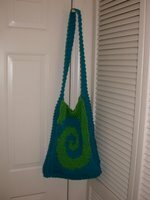 The bag's really cute....it's a bucket type bag that looks like it will have plenty of room to carry knitting projects. The really awesome thing is that the package also contained a whole project's worth of wool yarn in all kinds of purple, mauve, and maroon.......so I can just sit down and start on the Faire Isle bag immediately! The wool is "Wool of the Andes" from Knit Picks......I've been wanting to try their felting wool out....and now I have the chance! 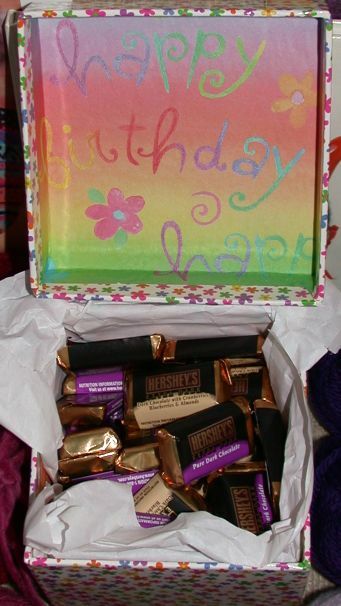 Thanks sooooo much Secret Pal! You're the greatest! You really know how to spoil someone! Wow! Here's our chance to be ambassodors for knitting! The second annual "World Wide Knit In Public Day" is this Saturday, June 10th. Follow the links on the website to see if there's an even planned in your town/state. You can always plan your own special celebration.....a picnic, knitting at the mall, etc. Found a GREAT Yarn Shop - "Woven Art"
As promised, my daughter took me to 2 yarn shops yesterday. (Poor kid....she had to suffer through mom acting like a kid in a candy shop.....pawing over all the wonderful yarns, books, and patterns. She was smart though, and brought her Chemistry project with her.....knowing ahead of time that I "fall into the abyss" when I enter a yarn shop!). I got both addresses and shop names from Knitty Chick (Thanks!!!!). One of the shops was absolutely fantastic. The other left us a bit "cold". More on that in a minute. The first shop, Woven Art, was in East Lansing. The owner (Nancy) was a very warm and talented fiber artist. Her shop was lovely and contained lots of yarns, patterns, books, needles, fibers, etc. It was a wonderful and welcoming place. At the front of the store was a table and chairs - great for laying out your project or spreading out yarns/books. In the center of the store was a circle of 4 very comforable chairs with a coffee table in the center.....one could sit knitting or sifting through books/patterns quite comfortably. The yarn surrounded you along the walls of the shop and there were a few small yarn displays dispersed around the "sitting area". At the back of the shop was the classroom section. The shop specialized in knitting, crocheting, weaving, and spinning.....so it's your "one stop shop" for all things fiber. The shop had a nice variety of samples - some of which were absolutely stunning. The owner made a gorgeous sweater jacket out of Southwest Trading Company Bamboo. It was really striking. My other favorite was a stunning wrap sweater made out of Rowan Summer Tweed and Crystal Palace Fizz from the Holiday 2005 Vogue. All her hand-dye yarns were beautiful! Of course I had to have some for myself! I had to purchase the 50% Silk/50% Merino hand dyed yarn in purples, blues, and green (it reminds me of irises). I also bought 2 skeins (560 yds. 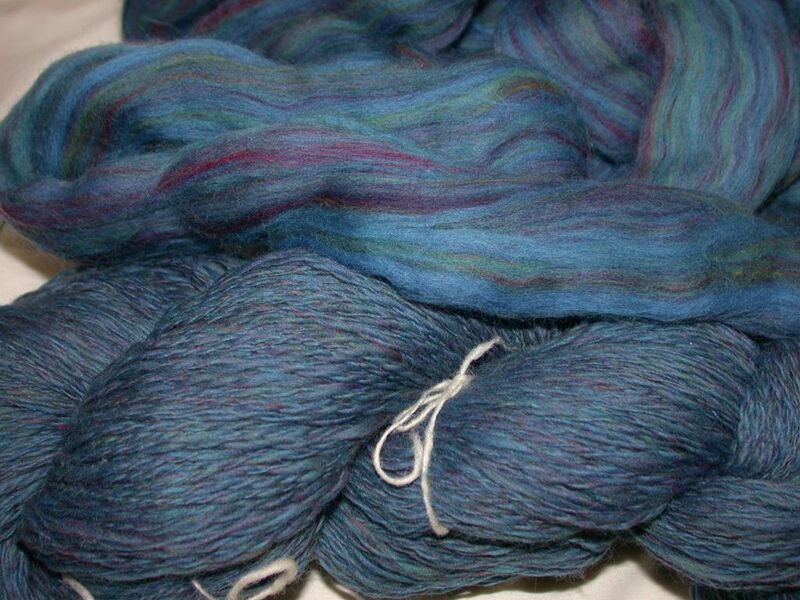 each) of superwash merino - one in purples and one in varying shades of blue. The second shop, "Yarn for Ewe" in Okemos was nice enough, but I just didn't get that "warm and welcoming" feeling when I went inside. There were some ladies sitting at the front table knitting and the store was jam packed with all kinds of yarn. 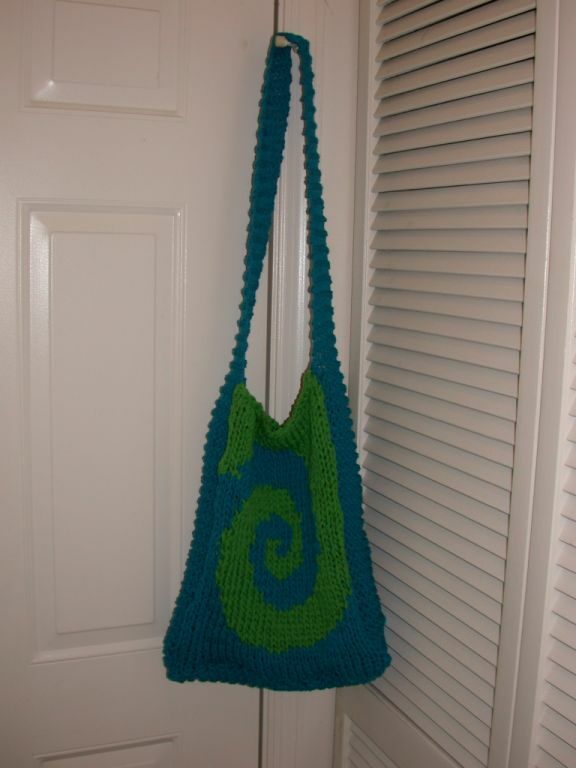 There were several felted bags - since I'm somewhat into that, it was nice to see them in "real life". I also was able to get the Rowan Book 37 that I'd been looking for as well as a couple of Jo Sharp pattern books. Here's the part that just kinda left us cold. One of the ladies that had been knitting went to the back of the store and used the restroom (you could hear it flush, etc.....so I KNOW there was a restroom back there!). Keep in mind that she was one of the ladies that had stopped in the store with a couple of friends after lunch to just sit around and knit. They were not taking a class or anything. Some of them may have made a purchase or two while they were there as well. I had my little stack of items to be purchased and had browsed through the yarns, chatted a bit with the owner and other customers in the store. My daughter was sitting quietly at the table working on her Chemistry. I was browsing through the feltable wool intending to select some yarn for a project I'm doing for a friend. There were several brands of yarn to chose from, so the selection process was taking me quite a while. Eventually, my daughter and I realized we needed to use the restroom (remember.....we'd been in the shop for a while now....looking at stuff and "stacking" up my items to be purchased). I asked the owner if there was a restroom we could use. Her reply was that the PUBLIC restrooms were next door at Quiznos.....we just needed to go out her door and to the right...then straight back into Quiznos. I was appalled on two levels. First of all, I feel it's rude to direct someone into ANOTHER business to use THEIR restrooms. Secondly, I felt that we must not have been part of the "in crowd", and therefore not ALLOWED to use her restroom (remember, one of the knitting ladies used it.....without even asking!) or perhaps she didn't feel that my purchases were considered significant enough to "allow" me to use her restroom (keep in mind that I was purhasing 3 pattern books.....and they aren't cheap!). I was sorely tempted just to leave at that point and NOT make ANY purchases. Instead, I decided to go ahead and make my purchases of the pattern books (the Rowan one was real tough to find.....I'd looked for it unsucessfully at several other shops....and I don't know who carries the Jo Sharp books). I decided NOT to buy any yarn. I'd ONLY buy the "necessities" - the pattern books. Based on my over-all experience, I do NOT plan on visiting "Yarn for Ewe" again.